Britain’s largest mortgage lender Halifax confirmed that a year to the end of October, house price inflation hit a low of 5.2% (it was at 10% is March this year so it has almost halved). 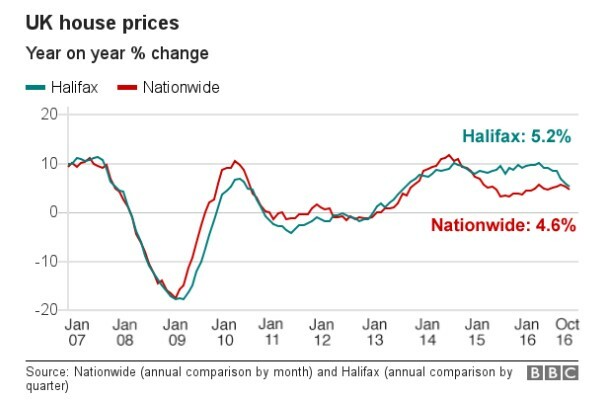 Nevertheless Halifax states that the house market rises remain “robust”. “This expected slowdown appears to have been largely due to mounting affordability pressures, which have increasingly constrained housing demand,” said Halifax’s chief housing economist, Martin Ellis. Nationwide Building Society confirmed that in their latest survey that house price inflation is down to 4.6% a year. Savills property estates have predicted that over the next 5 years that rents across the UK will rise faster than house prices. Savills have forecast an increase of 19% between now and 2021 and house prices only 13% across the UK and for London, it has forecast a greater increase of 24.5% for rents and only 10.9% for house prices. Savills believe that in 5 years’ time, the north will “outperform” the south .